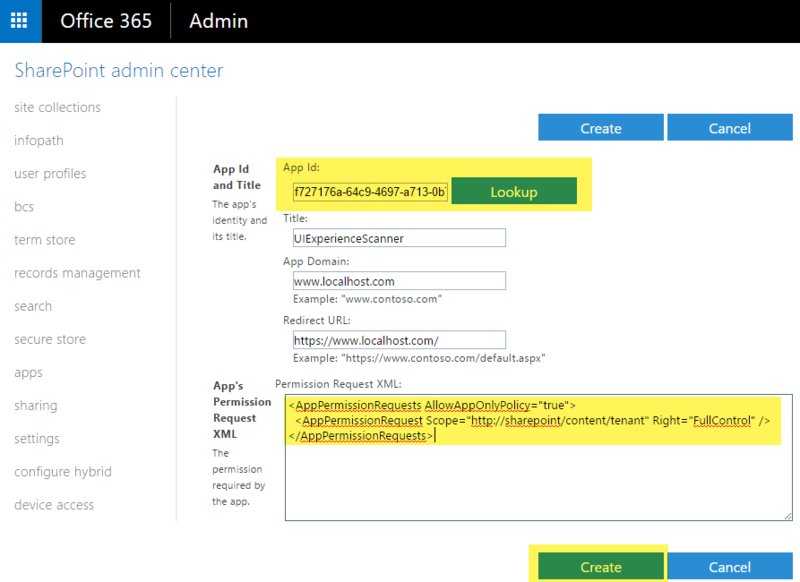 SharePoint App-Only is the older, but still very relevant, model of setting up app-principals. This model works for both SharePoint Online and SharePoint 2013/2016 on-premises and is ideal to prepare your applications for migration from SharePoint on-premises to SharePoint Online. Below steps show how to setup an app principal with tenant full control permissions, but obviously you could also grant just read permissions using this approach. Navigate to a site in your tenant (e.g. 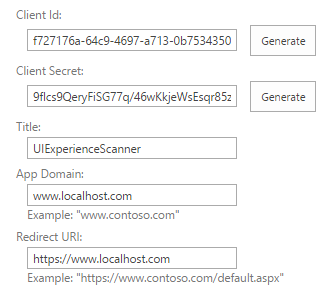 https://contoso.sharepoint.com) and then call the appregnew.aspx page (e.g. https://contoso.sharepoint.com/_layouts/15/appregnew.aspx). In this page click on the Generate button to generate a client id and client secret and fill the remaining information like shown in the screen-shot below. Store the retrieved information (client id and client secret) since you'll need this in the next step! Please safeguard the created client id/secret combination as would it be your administrator account. Using this client id/secret one can read/update all data in your SharePoint Online environment! With the preparation work done let's continue to the next chapter showing how you can use the created app principal via its client id and secret combination. Once the principal is created and consented you can use the principal's id and secret to request an access. The TokenHelper.cs class will grab the id and secret from the application's configuration file. //Get the access token for the URL. You can easily insert the TokenHelper.cs class in your project by adding the AppForSharePointOnlineWebToolkit nuget package to your solution.